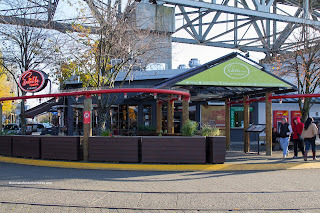 Our second stop on the Granville Island Dine Out Preview brought us to Edible Canada, which used to be located inside the Granville Island Market. 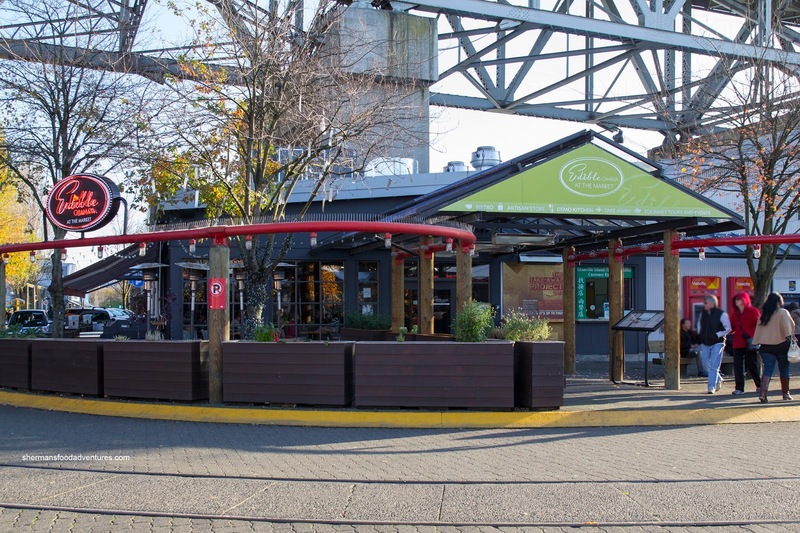 It has occupied the space across from it for a few years now and it is not only a lively bistro, it also has a small store attached to it at the back. The focus of Edible Canada is to use sustainable Canadian ingredient to create unique tastes that represent our vast nation. So their Dine Out Vancouver menu sports a few surprises including Alberta lamb heart and Newfoundland seal! 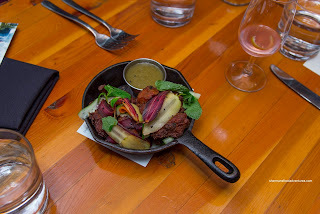 We started with their Pacific Cod and Pemberton Potato Pakoras with jalapeno apple chutney, fresh mint and pickles. Crunchy and spiked with cumin, these pakoras did represent the Indian-inspiration to the dish. They were a bit dry though, however, the sweet and slightly spicy chutney offered up enough moisture. The entire dish exhibited a spicy brightness despite the appearance of being heavy. 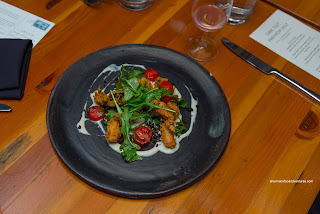 Next up was the Crispy West Coast Humbolt Squid with chermoula vinaigrette, white bean hummus and dried olives. I found the squid to be perfectly tender while super crunchy on the outside. The dish was on the saltier side, but the acidity from the vinaigrette provided some balance along with the pepperiness. 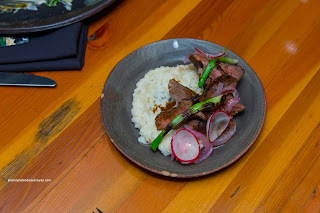 My favourite appie was the Grilled Alberta Lamb Heart with Gaujillo adobo, cilantro and hominy corn grits. Cooked to medium, the sliced heart meat was chewy, but in a good way. I would say it was firm, yet still completely tender. There was a definite spiciness to the dish provided by the adobo. I enjoyed the chunky hominy corn grits as they provided the necessary starch to the dish. Onto the mains, we had the Quebec Rabbit Orecchiette with mushrooms, confit onions, shaved brussels sprouts and parmesan. I found the fresh pasta to be firmly al dente while mildly seasoned. The buttery mushrooms added umaminess as well as an alternate texture. On top, the bitter and crunchy brussels sprouts went well with the saltiness of the parmesan. 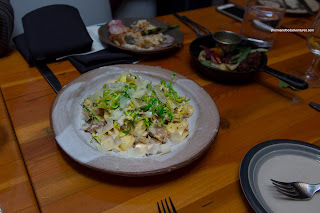 There was plenty of lean rabbit meat strewn throughout the pasta. Ending off the savoury dishes, we had the Haida Gwaii Rockfish & Mussel Stew in a Moroccan tomato broth with heirloom carrots, chickpeas and cilantro. I found the broth to be tomatoey with a balanced amount of sweetness, spiciness and tanginess. 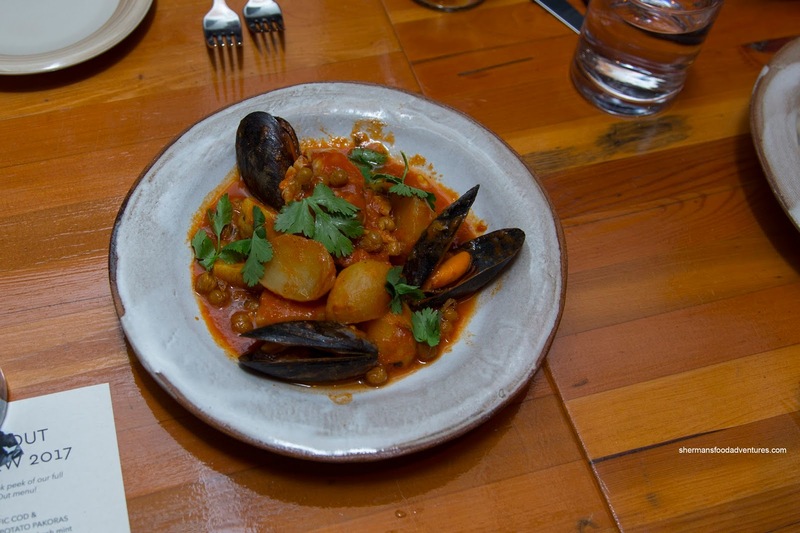 The fish was flaky and tender while the large mussels were briny and buttery. The addition of crispy chickpeas was a nice textural touch. For dessert, I was pretty impressed with the Pumpkin Sticky Toffee Pudding as it was not shockingly sweet like most versions. It was not as soaked either, so it ate more like a dense cake. That wasn't a bad thing though. Moreover, the amount of pumpkin was also restrained so it wasn't overwhelming. 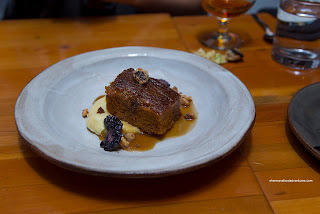 Loved the maple bourbon custard too as it was impactful and tasted like its description. 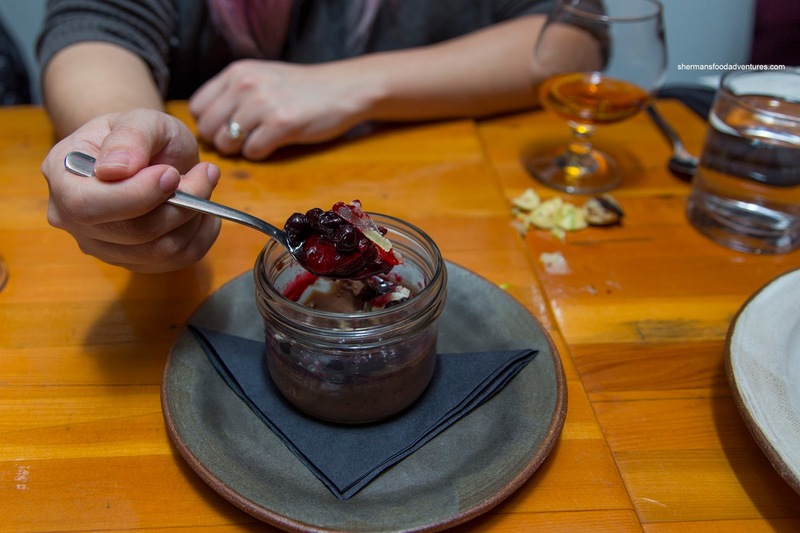 Lastly, we had the Chocolate Pout du Creme with cassis and crystalized ginger. The mousse was rich and creamy with a noted bitterness while not being sweet. However, the currents on top were pretty sweet as well as the candied ginger. These were just some of the samples from their large DOV $30.00 menu. A few items are subject to a surcharge though. However, for the base price, the menu is interesting enough to give it a shot.